57. How many records a select query soql can return? 58. What is the full form of AJAX? 59. Why do we need to write test classes? 60.How can you show a custom error message in trigger? 61. What is the use of future annotation? 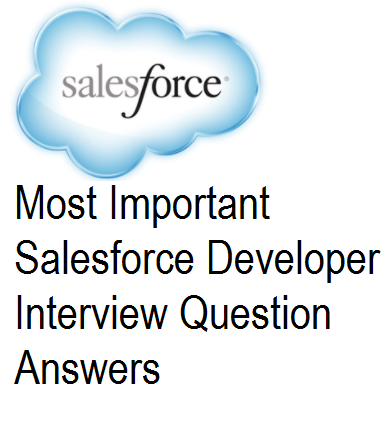 Ans: Future method starts execution when Salesforce has resources available.That is for asynchronous execution. 62. How to identify if a class is a test class? 63. How to convert a blob variable into a string? 64. what are the different methods of batch apex class? 65.What is' with sharing' in apex class code? Ans: When you use 'with sharing', user's permissions and field-level security are respected. In case of 'without sharing' code runs in system mode. 66. How many records can a sosl return ? Great information and really very much useful. Thanks for sharing and keep updating.